A rendering of the planned Outpatient Medical Center. Submitted photo. In the coming weeks, the Denver Health and Hospital Authority will hold a groundbreaking ceremony for its long-planned outpatient facility, an occasion likely to draw the usual mix of news media and VIPs. Not long after that, the health system will begin construction of something likely to receive less fanfare: its largest parking garage. The health system, which treated about 200,000 unique patients in 2017 and brought in revenue of $1 billion, submitted a site development plan to the city earlier this month proposing to replace the existing structures at 530 and 550 Acoma St. with the seven-story garage. 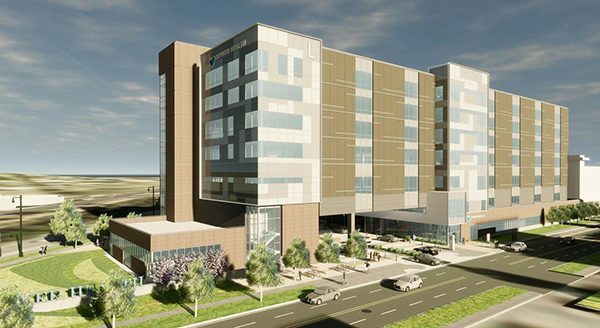 Wade Eversole, Associate Chief Operating Officer at Denver Health, said the project will add 1,246 additional spaces and alleviate frustrations of some employees. “If you got all of my emails related to parking, you’d understand why I say I’m excited,” he said. The planned 300,000-square-foot Outpatient Medical Center has received a fair deal of press, largely because it’s one of the projects receiving funding from the $937 million bond package approved by voters last fall. The facility will be constructed at 660 Bannock St., which had been home to a building that housed administration, paramedic offices and the Denver medical examiner’s office. Demolition of that structure took place earlier this summer. Ebersole said Denver Health expects to break ground on the outpatient facility at the site in the next month. The bond package will fund approximately half the anticipated $150 million cost, with the health system and private donations picking up the rest. Ebersole said the hospital hopes to have the new outpatient facility open in the second quarter of 2020. And the hospital is aiming to complete the new garage ahead of it. No bond money is going toward the cost of the garage. But the two projects are somewhat related, Ebersole said, because a condition of receiving the bond money was that Denver Health would add about 600 parking spaces to its campus. The proposed garage would more than double that. Ebersole said Denver Health tries to encourage employees to find ways other than driving to get to the campus, offering shuttle service to a nearby light rail station and incentives to those who give up their designated spot. But parking remains in high demand. “Our employees are frustrated. We’re pretty up front when we hire people, that it’ll be several months before you get a dedicated parking spot,” he said, noting that there are first-come-first-serve parking lots available to employees in those months. While Ebersole said he generally hears about parking from employees, patients will benefit, too. The health system plans to convert the 697-spot garage at 671 Acoma St. from employee to patient parking. The new structure will be the fourth dedicated parking garage on the campus. The one at 671 Acoma St. is the most recent, having been completed in 2015. The one on the corner of 6th Avenue and Delaware Street is currently the largest, with 1,096 spaces. The site of the planned garage is divided into two parcels. The 0.53-acre 550 Acoma St. parcel has an approximately 20,000-square-foot, single-story building on it. Denver Health purchased the property in February 2012 for $1.8 million. The 0.78-acre 530 Acoma St. parcel has an approximately 38,000-square-foot, single-story building on it. After leasing the building for years, Denver Health purchased the property in May, paying $9.65 million for it and the adjacent 55 W. 5th Ave. parcel, which is not part of the development plan. Ebersole said the buildings house the health system’s information technology staff, who will be moved elsewhere within the campus. Garage plans, which still need city approval, call for a 2,578-square-foot commercial space on the ground floor facing Acoma. Ebersole said Denver Health hasn’t decided if it will use the space or lease it out. Ebersole said the health system also plans to install solar panels on top of the structure. Turner Construction is the general contractor for both the outpatient facility and the garage. 2 Comments on "Denver Health looks to add seven-story parking garage"
“We encourage employees to not drive” and “we’re excited to build a new 1200-space garage” are mutually exclusive statements. There should be no new garage here or anywhere in the city. Millions of dollars which could be going to care or equipment will no be going to empty car storage instead. This whole campus is already a wasteland of parking. What a shame. Especially after taxpayers were so generous to chip in. Whether or not taxpayer money is directly funding this parking garage, Denver Health has money they are spending on parking instead of improving their healthcare services.